Knicknamed the Scrambler this unconventional muscle car had a compact body and big boy engine that gave it enough kick to put down many of the bigger classics. AMC made the regretable choice to release the SC/Rambler with a paint job that made it look like a 4th of July decoration, but as a restoration project that won’t matter. Get creative! Intended as a halo car to get enthusiasts attention only 1512 SC/Ramblers came off the assembly line. Because of the scarcity of orginal parts clone cars have become a popular rebuilt alternative, but accurate clones are difficult to pull off. Under the hood this bright little guy boasts a 390 V-8 that kicks out 315hp during chassis dyno testing. And it was a beast in the quarter-mile ripping off times that previously had been the exclusive territory of Hemis and Cobra Jets. 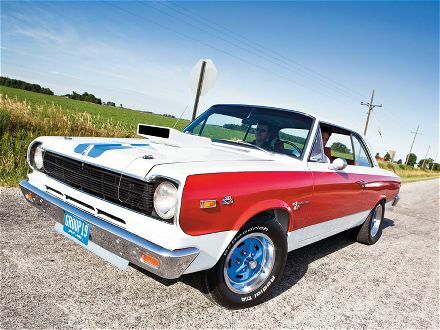 The scooped hood, the euro-style side mirrors, the Hurst SC/Rambler badges and the blacked-out, badge-less grille and rear trim all came only on the SC/Rambler, but all can be difficult/costly restoration parts to replace. In general AMC parts have become more difficult in recent years because their cars have become a popular altenative to the more expensive classics. This may not be the easiest project to get just right, but if you do you’ll have a unique ride and absolute screamer.